Anna has won many Gold medals from many competitions in the Special Olympics. More than anything in this world for Spring Break this year Anna wants to go to New York. Anna wants to show all her medals to all her favorites at Good Morning America. You can help her by liking her Facebook page, Anna’s trip to New York. Go on, like her! I did! I messaged her my answer; she said I was wrong, and the Tribune said I was right. I supposed technically Mrs. Houseful had the right answer! 1. I enjoy a good riddle. 3. You can pick any giraffe you want to, and people’s personalities are definitely showing in their giraffe picks. Did you notice? This week I had a Halloween article published on Queen Latifah’s website! Click the button below to read it! I share my pre-trick-or-treating party ideas to hopefully prevent those post-trick-or-treating meltdowns! Can you believe it’s almost November? For the past few years, I’ve participated in NaBloPoMo, and so of course I’m trying it again. That means a new blog post every day for a whole month! Lucky you. I’m also linking up with yeah write, where I met some incredible writers last November. I haven’t had time to participate in their weekly writing challenge lately, but they are the group responsible for motivating me to write my BlogHer Voice of the Year winning essay. 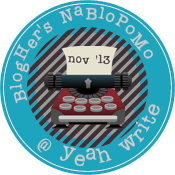 Are you joining NaBloPoMo? Or more importantly, do you have a giraffe as your profile picture? Congrats on the Queen Latifah magazine feature and the BlogHer winning essay. Hope that NaBloPoMo is as productive for you this time around! Hello Ginny Marie! I have FINALLY read your story and thought I’d leave a hello. What a beautiful story and a beautiful family. You are truly blessed and I know you know it. Thanks so much for stopping by, Jenny! Yes, I have received many blessings over the years. It’s nice to reconnect with you! LOL I actually got that riddle right (and I don’t always do). I love riddles…Love the story on Anna too! I hope she gets to 100K soon. Are you going to BlogHer next year? I am so excited that it will be my first one! Oh, I am so jealous! I’m not sure I can afford to go next year. We’ll see! I didn’t have to get a giraffe fortunately. But I must admit I was helped a bit by several somebodies who wrote the wrong answer (which would have been mine by the way) and made me think again. Love the post on Queen Latifah! You are getting to be a celebrity now! Can I have your autograph?? And I like the honesty with the riddle too. I haven’t been asked the question yet but I already know the right answer so I guess I’m automatically disqualified! I just read about NaBloPoMo. I would love to try it but I am terrified!! I can barely find time to post twice a week – I cannot imagine doing it every single day! Got ti give it some more thought . . . . Totally got the answer right according to the Tribune. But…didn’t change the picture, but that’s mostly out of pure laziness. I’m like “I have to find a picture? Eh…no.” Laziness. Not doing the post a day but I am doing including something I am thankful for each day in November! Thankful posts are the best kind! I’m looking forward to reading them!